Advertisement revenue of the Icelandic media has halved since its all-time-high in 2007, as calculated in fixed 2015 prices. The media’s revenue from advertisements totalled around 12,000 ISK million in 2015. This corresponds to 36,000 ISK per capita. Newspapers are the single most important advertising medium in the country retaining 49 per cent in 2015. The Icelandic market shows some special traits compared with the Nordic countries and elsewhere. Much larger share of the advertising cake falls into the hands of newspapers and radio than in most other countries and the web is still a relatively underdeveloped advertising medium. Moreover, advertising spending in Iceland is lower than in the other Nordic countries as share of Gross Domestic Product and per capita. In the advent of the financial collapse in Iceland in autumn 2008 advertisement revenue of the media dropped by 27 per cent, in current prices. From 2010 and onwards the revenue has incremented slowly albeit surely, and is now a little higher than when its highest in 2007. The drop in the advertisement revenue of the media was even more severe if measured in real prices (2015 prices). Accordingly the advertisement revenue of the media fell by 68 per cent from 2007 to 2009, but have since increased a little and are still 53 per cent lower than the year before the financial collapse in 2008. 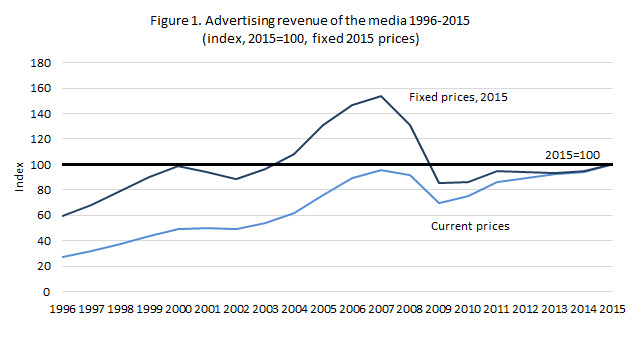 Advertising revenue of the media in 2015 was identical to the revenue in 2000, calculated in fixed prices (see figure 1). The fall in the advertising revenue of the media in Iceland is comparable to what has happened in some of the Nordic countries. 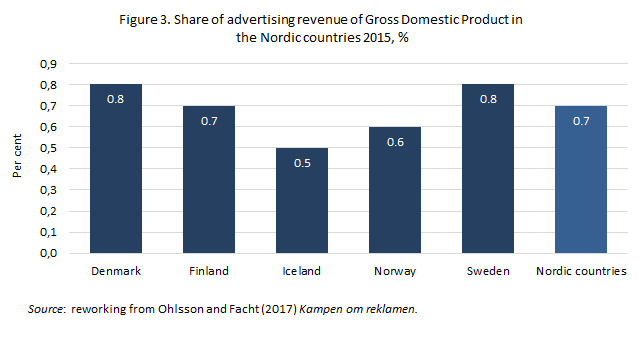 From 2008 to 2015 advertisement revenue of the media declined in Denmark some 22 per cent, in Finland 25 per cent, in Norway 15 per cent but only four per cent in Sweden, calculated in fixed 2008 prices (Ohlsson and Facht (2017) Kampen om reklamen, p. 53). Comparable figure for Iceland is 23 per cent. The print media (newspapers and magazines) earned almost half of the advertisement revenue of the media in 2015. Newspapers (dailies and non-dailies) were the single most important advertising medium with 43 per cent of the total advertising spending on the media. Television was the second most important, with 21 per cent. Radio came third with 15 per cent, followed by the web with 13 per cent. The share of others was significantly lower, with six per cent share of magazines (including papers issued less than once in a week) and two per cent share of cinemas (including video). Since 1996, the division of the advertising cake between different media has changed somewhat. This applies specifically to the print media (newspapers and magazines), whose share has dropped from 60 per cent down to 49 per cent. Most important is the decline in share of newspapers from half to 40 per cent. Gradually lessening importance of newspapers as advertising medium can to a large extent be explained by two interrelated factors, i.e. the advent and development of the web media and dwindling circulation and reading of newspapers. In the early 2000s the share of the web media in the advertising revenue was limited, or less than five per cent. Since then the share of web media has gradually increased up to some 13 per cent in 2015. Some 60 per cent of the advertising revenue of the web media falls in the hands of web sites of traditional media. The importance of independent web sites has increased gradually in the more recent years, up to 40 per cent of total. No account is taken here to advertising expenditure on non-domestic web sites. It can be estimated, however, that the amount which is paid for advertisements on foreign web sites is considerably lower than for domestic web sites, or less than a quarter. The recession which has reigned on the advertising market in Iceland since in 2008 can further be highlighted by viewing advertisement revenue of the media as share of Gross Domestic Product - GDP (see figure 2). 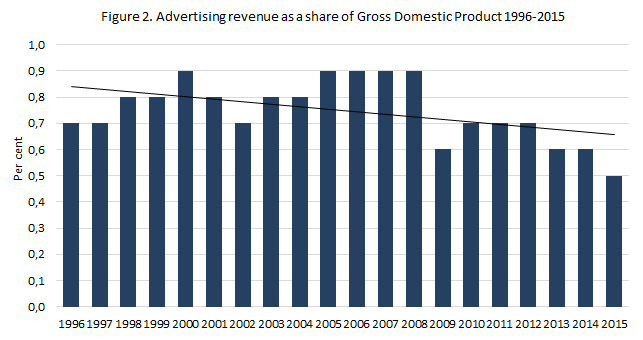 Advertising revenue as a share of GDP has lowered somewhat since in 2008. In 2015, advertising revenue of the media amounted to 0.5 of the GDP, compared with 0.8 in 1996-2008, on average. This is a considerably lower portion than usually in the Western world, where advertising revenue of the media has for some time been around one per cent of GDP (cf. Doyle, Understanding Media Economics, 2013; Hoskins, McFayden og Finn, Media Economics: Applying Economics to New and Traditional Media, 2004). In 2015, similar share was 0.8 per cent in Denmark and Sweden, 0.7 in Finland and 0.6 in Norway, or an average of 0.7 in the Nordic countries (see figure 3). 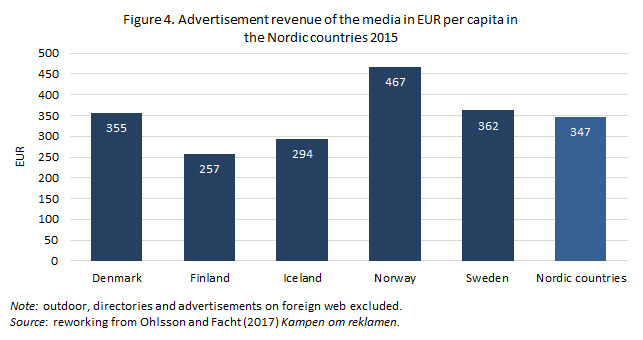 Total advertising revenue of the media in Iceland in euros per capita was in 2015 the second lowest of the Nordic countries in 2015, or little higher than in Finland (see figure 4). The particular traits of the Icelandic adverting market are clear when the share of revenue between media by kind is considered. The share of newspapers and radio is significantly higher in Iceland than in most countries. Similarly, Iceland is unique among the Nordic countries and elsewhere having an exceptionally small share of the web in the advertising revenue. Share of newspapers in the total revenue is lowest in Iceland and Finland as is shown in table 1. Nowhere else retains radio higher share than in Iceland. The reverse applies to the web. Note: outdoor and dircetories exluded. Sources: based on eMarketer, www.emarketer.com; McKinsey and Company, Global Media Report 2016; Ohlsson and Facht (2017) Kampen om reklamen. A certain caution must be taken for an international comparison in this particular field of subject. Methods vary significantly between countries and the figures are often partly estimates. Information about advertising revenue of the media are derived from annual accounts and according to information from The Icelandic Media Commission from 2011 and onwards (previously from Statistics Iceland). In the instances when information is lacking from media operators the advertising revenues are estimated from VAT tax reports. The data do not include outdoor and directories or advertising on non-domestic web sites.